Written to accompany Dutch author Brother Andrew’s inspiring 1967 memoir, this literature study guide by Sabrina Justison helps you get the most out of God’s Smuggler. Literature study guides from 7SistersHomeschool.com inspire students rather than tire them with busywork that kills the story. Introduce your homeschooling teen to 20th Century History from a Kingdom perspective with God’s Smuggler by Brother Andrew. Brother Andrew witnessed firsthand some of the 20th Century’s pivotal events. He lived in the Netherlands during the Nazi occupation in World War II, fought with the Dutch in independence wars in Indonesia, and after becoming a Christian, dedicated his life to smuggling Bibles into the Soviet Union during the Cold War. God’s Smuggler has inspired our own homeschoolers to think about their faith as more than just a Bible class but a lifestyle – and not a boring lifestyle, at that! encourage the reader to explore the reasons behind the methods of the Communists and Brother Andrew’s response to these methods. 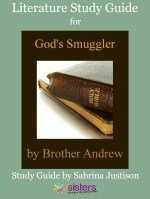 Click here to view an excerpt from God’s Smuggler Study Guide. What are homeschool parents saying about God’s Smuggler Study Guide? “I purchased the “God’s Smuggler” Study Guide about 2 years ago when my boys were in 8th and 10th grades. We were studying about the Cold War in history and I had been wanting to share the book “God’s Smuggler” with my boys since I remembered reading the book in high school myself. I read it aloud to my boys and loved having the chapter comprehension questions to ask them after each chapter. Having all of the answers printed out at the end of the study guide was also very helpful even though I had just read the chapter. Each chapter had about 1 – 6 questions which covered the material, but didn’t “kill” it. There were also 14 vocabulary words to look up and learn to better understand the story. Highly recommend this product.” – Beth G.
“As a teacher, Sabrina’s literature guide for The God Smuggler was a valuable resource for class discussion, quizzes and tests. It would also be a great SundaySchool guide as you read through it together. Thanks so much for creating this guide!” – Amy M.